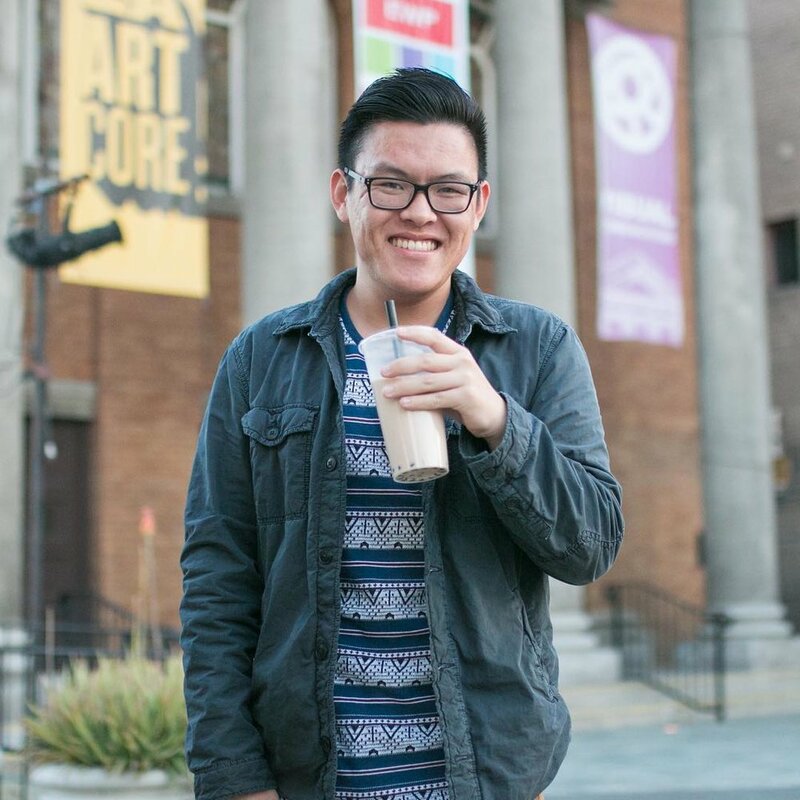 BRIAN: I’m a fourth year Psychology and Asian American Studies major at UCLA. I try to be involved and up to date with what’s going on in Los Angeles Asian American, specifically Japanese American and Chinese American communities. I’ve been working at VC since January 2017, in the Archives. My main job has been helping the founders digitize their physical negatives (for the At First Light project). That way the photos can be preserved for posterity and it’s easier for people to use our images for research purposes. I’ve also been helping them clean and organize their hard drives that have a lot of the photos on them (no one has actually cleaned these things for over 10 years). What is an interesting picture that you’ve found in the scans? One of my favorite photo series is the Hiroshima-Nagasaki Remembrance March that they had in the early 1970s. It was when the Vietnam War was still happening. People marched through Little Tokyo, to the Federal Building, and then they had a candlelight vigil to remember the victims of the atomic bombs. It was a really cool series that showed people of all ages marching, and it was a very moving scene. I think that’s what’s really special about the VC Archives -- there’s so much history and so many things that I would have never known about. Obviously you can’t put every protest or event into a textbook, but very few people have the opportunity to be able to see the photos of past events and just everyday activities, especially of Asian Americans. It’s been a great experience seeing all these different photos, whether it be the normalcy of going to an amusement park or huge protests against the industrialization of the Little Tokyo area. Do you want to go into the arts or activism once you graduate? I’m going to be in a lot of school...hopefully. My plan is to do, to my dismay, at least 7 more years to do a PhD program. So I’ll be in school for a very long time because I apparently don’t want to begin adulting just yet. As a “veteran” VC intern, being here the longest, what have you liked so far about VC? I think it’s a really great place to be, especially if you really want to get connected with the Los Angeles API community and people who have been around Los Angeles Asian American activism for a long time. Honestly, you really don’t know who’s going to be showing up everyday. A lot of times people come say “Hi” because they know the place and they know the staff here. Sometimes you’ll meet some people that you’ve read about in textbooks. I think it’s really cool that VC is such a central place to the Asian American community. On December 2, 2017, Visual Communications and Nikkei for Civil Rights and Redress (NCRR), in partnership with the Japanese American National Museum, hosted “Speak Out Revisited: The CWRIC (Committee on Wartime Relocation and Internment of Civilians) Hearings and Its Legacy.” The program included clips from “Speak Out for Justice” and a panel featuring Duane Kubo, Harry Kawahara, Jim Matsuoka, and other people involved in the Japanese American redress and reparations struggle. The panelist spoke about the the difficulties of getting issei and nisei involved in the movement, the changing viewpoints of the American public, and the lasting lessons learned from the movement. As a yonsei born 10 years after the redress movement, the events that transpired seem distant. I come from a generation where few know the history of Japanese Americans nor do many care to learn it. The incarceration camps are a fading memory of our increasingly disappearing grandparents. While I attended “Speak Out Revisited,” I could not help but notice that I was well in the top three youngest attendees, if not the youngest. The attendees — many of whom are still active in LTSC, NCRR, JACL, and other social services and civil rights organizations — are a treasure trove of information for my generation. These are the activist who fought for Asian American Studies, fought for the United States government to apologize for their misdeeds, and fought the idea that Asian Americans are a model minority who can be willingly oppressed. In the age of increasing political turmoil, the lessons learned from these battles are not only needed but necessary to survive. I highly encourage nikkei youth to begin attending events like these in order to learn more about the discrimination our community faced in the past and are currently facing in the present. As the sanseis continue to get older, it is imperative we learn how to be active contributors of not only the Little Tokyo community, but the Japanese American community in general. While also learning about our own community, we must learn how to be allies to communities being attacked. The lives of nearly 800,000 DACA recipients are at risk due to its unknown future. While the Japanese American community does not have a large population on DACA, illegal immigration is still a huge part of our history. My great-grandfather came to America by coming on a merchant ship to Hawaii and staying long past his expected and his story is not unique. Additionally, incarceration is still being used as rhetoric against Muslims since after 9/11. This is something we can never let happen again to anyone.